LEWISTON — Somebody doesn’t want Bates College students to vote Tuesday. 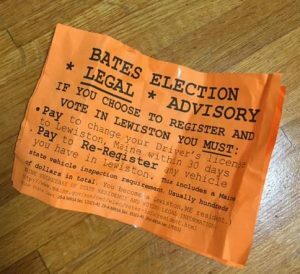 Sometime Saturday, orange fliers appeared at a number of dorms and at the school’s dining hall claiming to be a “Legal Advisory” for Bates students. The papers gave no indication of their creator or distributor, despite a legal requirement that they carry a disclaimer. “They’re all over the place,” said senior Meghan Lynch, though students had ripped most down by Sunday afternoon. They also pointed out that registering a vehicle requires passing an inspection and usually costs hundreds of dollars. Maine law does not require a driver’s license to vote. 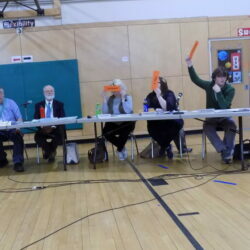 Students are allowed to vote as long as they consider themselves residents of Lewiston. Here are the rules for college students seeking to vote, as outlined by the secretary of state in 2012. She said that while she was out knocking on doors Saturday to try to round up votes for a ballot question that would hike the minimum wage in Maine, someone else was at Bates trying to intimate students into staying home on Election Day. “It shows how much some people don’t want us to vote,” Manter said. “It saddens me deeply,” Lynch said. She said it is “so, so problematic” to deter students from heading to the polls at the time in their lives when many are awakening to the importance of politics. “Maine has a proud history of high voter participation, and misleading voter suppression tactics like these are simply unacceptable,” Golden said. Manter said she’s sure the fliers succeeded in discouraging at least some potential voters on campus, freshmen who don’t know any better and other students who might have participated for the first time. Manter said that’s frustrating. Matthew Gagnon, chief executive officer of the Maine Heritage Policy Center, had a different take. “All students have to do is declare they live here. That is a basic threshold we all need to do to vote in places we live,” Gagnon said in a tweet Sunday. He called the flier stupid, but accurate. Petrella pointed out that the fliers come “on the heels of a proposed amendment to the city of Lewiston charter proffered by local conservatives to move off-year municipal elections from November to June,” an indication of how much they want to keep students from making a difference at the voting booth. “My hope here is that this latest disenfranchisement attempt emboldens Bates College students to vote in record numbers on Tuesday,” Petrella said. “Whoever is responsible for this should be ashamed of themselves. It’s incumbent on all of us to spread the truth,” Cain said in another tweet. Mike Tipping, communications director for Mainers For Fair Wages, called the voter suppression bid reprehensible. State Sen. Nate Libby, a Lewiston Democrat, blamed the Maine Republican Party for the mysterious fliers. He said Maine Republicans are peddling garbage. But Jason Savage, executive director of the Maine GOP, said it “had nothing to do with the Bates flyer.” He also pointed out that the newspapers Libby griped about were also not done by the Republican Party. “If you want to see some dishonesty being dished out,” Savage added, “go watch some Emily Cain TV ads attacking Bruce Poliquin.” Cain is hoping to unseat Poliquin, an incumbent Republican congressman. “There is nothing in Maine law that states that college students must change their driver’s licenses in order to vote. In fact, the Secretary of State’s office has made explicitly clear that a dorm can be a student’s legal voting residence, and that paying out-of-state tuition does not preclude a student from voting,” he said.